Total Noodle Overload. I never thought it could happen. I never imagined it might happen to me. But TNO was the result after 5 days traveling with my little brother in Ningxia province, Northwestern China. I have never been anywhere where noodles have been so omnipresent a staple food, and I have been to some places in this world. In my previous post a while back, I described a trip through Xinjiang and Gansu, from the China-Pakistan border to the Silk Road city of Lanzhou, detailing the noodles I ate along the way and talking about the history of the noodle in Inner Asia. Ningxia is the next step along the ancient noodle trail, sandwiched between Inner Mongolia, the Tibetan Plateau, the deserts of Western China, and the ancient capital of Xian. In other words, we're talking dough country. Never have I eaten so many different kinds of noodles in such a short period of time, and, accordingly, never have I gained so much weight so quickly. 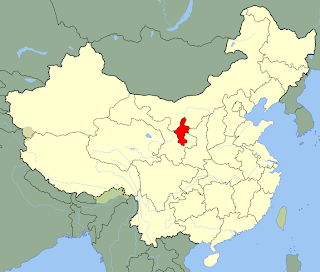 Ningxia's full name is the Ningxia Hui Autonomous Region - The Hui people are, more or less, Chinese Muslims. My impression before visiting Ningxia was that the Hui were essentially the same as the majority Han Chinese, but with ancestors who had converted to Islam; this is not really entirely true, as many Hui people I talked to self-identified as Arabs and traced not only their religion, but their ethnic heritage to the Middle East and Central Asia. For ethno-national reasons which are perhaps beyond the scope of a noodle blog, "Hui" was essentially a term which ended up applied to all non-Uyghur (the Turkic people of Xinjiang) Muslims - so you could be a Muslim Indonesian-Chinese and be "Hui" depending on where you happened to be living when the revolution went down. In any case, the culture of Ningxia, which is the "official" Hui "Autonomous" Region (sorry, scare-quotes are kinda necessary when talking about ethnicity in modern China) is definitely influenced by the Muslim world, and feels like a cross between Xinjiang and, uh, the rest of China. In any case, they got hella noodles! Lanzhou-style noodles, Tibetan-style noodles, Xinjiang-style noodles, I-ain't-never-seen-a-noodle-like-this-before-style noodles, and my brother and I ate more than a few. Walking through the streets of a typical town in Ningxia, we found two kinds of restaurants - grilled meat shops and noodle houses. My brother is a big meat guy, so he had the grilled lamb option to fall back on, but since I'm mostly veg, noodles was often my one and only choice. By the second day we decided to go for the gusto and try a new kind of noodle at every meal. I can't say I know the proper names of most of these, but here we go, a brief tour of the noodles of the Ningxia Hui Autonomous Region! Our first stop was Guyuan, the largest city (a relative term) in the southern part of Ningxia. Southern Ningxia is much more heavily Muslim / Hui, while the north feels similar to anywhere else in rural Northern China. After wandering around for a while wondering what the hell we were doing in an obscure corner of a province that gets something like 1% of the country's tourists, we stumbled upon the ever common site of a card game on the street. My brother's a bit of a card shark, so we stopped to watch and ended up striking up a conversation with some other onlookers who treated us to noodles and picked our brains about George Bush and our views on gun control. Resembling toothsome Shanxi-style daoxiaomian, but weirdly gray in color, I sadly forgot to take a picture of the noodles in question. Imagine, these bad boys, but uhh...grayer. I had never seen noodles like these before, and have never seen them again - a mass of tiny nuggets somewhere between gnocchi and mini pasta shells, served in a thick lamb soup gravy, spiced up with cilantro, cubed tofu, onions, and plenty of chili. Served in a bowl wrapped in plastic, paired with a side of cumin-encrusted grilled bread, our sommelier recommended warm pineapple-flavored beer with this dish. Mind-blowingly good. Next up was a trip to the Xumishan (the Chinese name of the mystical Mt. Sumeru) grottoes, one of the most spectacular but least visited collections of Buddhist carvings in China. Built first by the Tuoba people of the Northern Wei dynasty 1500 years ago and still being added to in the Tang dynasty hundreds of years later, the grottoes are a series of hundreds of cave temples built into a large swath of rocky hills located in what can only be described as the middle of nowhere, an hour or so's ride into the wasteland from the already obscure Guyuan. The enthusiastic 8-year-old guide to tourist ratio was well over 1:1, and we spent the morning poking around the ruins. Afterwards, we hitchhiked back north past endless sunflower fields with a Britney Spears-listening Muslim family, though hitchhike is a relative term in an area so rural that nearly every car doubles as a taxi. Lunch was in the township of Tongxin, where the looks on the other customers face seemed to betray the by now familiar expression of "whoa, there are some coneheads in this restaurant!" We split a veritable mound of chewy and tasty sliced dough tossed and stir-fried with onions and peppers, as well as a less exciting dish of the thin wheaty postage stamps in a somewhat bland tomato-flavored broth. And of course the sides consisted of warm pineapple beer and bemused Muslims. We worked our way through the desert back to the capital of Yinchuan the long way, avoiding the highway and taking an endless procession of progressively tiny buses while checking out packed earth stretches of Great Wall ruins and being regaled by local schoolteachers with advice on where to find good hookers. From Yinchuan, we headed to the north, with the wastelands of Inner Mongolia just on the other side of the razorlike Helan mountains. On the plains sat a rock fort that had been converted into a film studio, where essentially every movie scene depicting Northwest China (Red Sorghum, Ashes of Time, etc) you have ever seen was shot. Lunch was some bland linguini in a tomato broth with some allegedly health-bestowing local mushrooms that tasted like, uh, dirt. Nestled in the nearby mountains were ancient stone pictographs, twin stone pagodas, and more wild animals (mostly mini-gazelle type things) than I had seen everywhere else in China combined. Naturally, sightseeing left us hungry, so after some deliberation we decided on...noodles. My brother had not yet sampled the delights of Lanzhou lamian (niuroumian - pulled noodles in beef soup), so we found a halal restaurant and got set up. While not as epochal as the ones I had eaten in Gansu the summer before, they were definitely superior to most bowls in Beijing. Our last stop before skipping town back to the Chinese seaboard was the tomb of one of the emperors of the Tangut Western Xia dynasty, also known as "The Great Pyramid of China," which might also be called "A Big Mound of Dirt, But Nonetheless a Pretty Impressive One." 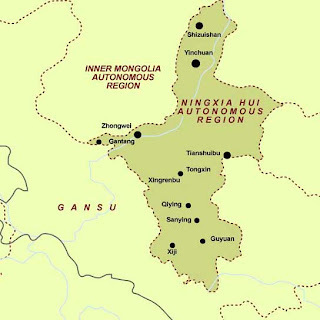 The Western Xia were a powerful but by now largely forgotten empire, and from the 11th to 13th centuries, they governed a kingdom in what is now Northwest China that they called "The Great State of White and High" until getting, uh, totally murdered by Genghis Khan. I couldn't say what their stance on noodles was, but they left some weird ruins and developed what might be the most difficult written script known to man. Two guesses what our last meal consisted of. We got a taxi driver to take us to his favorite noodle joint and were rewarded with more thick and tasty hand pulled noodles. I got the veggie version with pickled peppers added to the classic Chinese mix of stewed tomatoes and overcooked egg, but spent most of the meal gazing longingly at my brother, who had ordered the noodles in lamb soup and had no intention of sharing. We raised our bowls of Xixia beer in a toast to the unsung noodle capital of the world and headed for the airport. I was five pounds heavier and it would be a week before I could even look at a noodle again, but noodling in Ningxia was an experience I won't soon forget. Wow, your blogroll expanded with rameny goodness. I'll never get how people can be this fanatical about it. I mean, it's tasty, but I'm just like, "Them sure be some tasty oriental noodles right thur." You're gonna have to school me sometime. I hadn't seen that site, thanks! It looks like he hasn't updated in a while, which is too bad, because I like how he does the area-centric approach. Do you have any idea how to set up a map function like that? as someone who also obsessively loves ramen AND has been to ningxia, but am new to your blog, i thought this was really informative & accurate! i also wish i could eat some noodles right now. @clara - awesome! many people can say they love noodles, but not that many people can say that theyve been to ningxia. what are the odds huh? ive been to shanxi too, and indeed enjoyed many great noodles there, though i didnt have the forethough to photograph many of them. if you click on the china tag you can find a whole post giving much love to shanxi-style daoxiaomian. keep on reading! got any other favorite noodle joints on any continent? I think the mini gnocchi/pasta shell thing you ate is what people in Shanxi call mao erduo (猫耳朵， cat's ears) or mashi (麻食）. Looks delicious, whatever it is!